It is done, on June 1 just before 4 pm, Donald Trump did the unthinkable, he announced that he was withdrawing the United States from the Paris Climate Accord. In so doing he may have sentenced future generations to an apocalyptic future. As the news broke, I couldn't help but think of the iconic "blue marble" photograph of the Earth taken by the crew of the Appollo 17 on December 7, 1972. 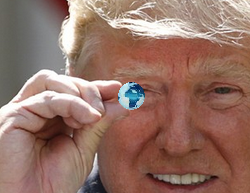 Almost 45 years later I am struck by just how fragile the little blue marble seems in the tiny hands of Donald Trump. The announcement came in a highly choreographed ceremony in the Rose Garden in which Vice President Pence and EPA administrator Pruitt both lauded Trump's crime against humanity. Make no mistake about it these are crimes and future generations will hold this administration to account for what they have done. Some have argued we should give the new president a chance and see what he does. Now even the most optimistic souls must realize that while this is not a war of our choosing, we must defend our planet from this administration. Now more than ever future generations are calling us to enjoin the struggle. This means we must collectively bring to bear all the legal means at our disposal so that we can unrelentingly oppose the dystopia of the Trump regime. The chorus of disagreement both within and outside of the US has been staggering. This has prompted Christiana Figueres called the move "vacuous political melodrama". She also tweeted "Thank you Trump. You have provoked an unparalleled wave of support for Paris and determined resolve on climate action. Deeply grateful." Trump's move is bad for the US and the planet. The decision effectively abandons humanity and condemns future generations to an apocalyptic hell. Historians may one day argue that this day was foreshadowed on November 8. While every country in the world has signed on to Paris. Thanks to Trump the US now joins Syria and Nicaragua as the only two nations that have not joined the climate accord. This is the end of American leadership for the foreseeable future. It is not overstating the case to say that June, 1 2017 may go done in infamy as the beginning of America's decline. I have argued that Trump could help to legitimize his government by embracing the Accord. In quitting the deal Trump has lost what little legitimacy he had left. His authoritarian style of government is the most ignorant and incompetent in American presidential history. Here is the full speech of Trump announcing his withdrawal from Paris. Newly elected French President Emmanuel Macron said Trump had made, "an error for the future of his country and his people and a mistake for the future of the planet.” In a separate joint statement with the leaders of France and Italy, Merkel said the agreement "cannot be renegotiated." "The nations that remain in the Paris Agreement will be the nations that reap the benefits in jobs and industries created,” former President Obama said in a statement responding to Trump’s announcement. But even in the absence of American leadership; even as this Administration joins a small handful of nations that reject the future; I’m confident that our states, cities, and businesses will step up and do even more to lead the way, and help protect for future generations the one planet we’ve got." Former Vice President and the Chairman The Climate Reality Project, Al Gore said, "Make no mistake: if President Trump won’t lead, the American people will. Civic leaders, mayors, governors, CEOs, investors and the majority of the business community will take up this challenge. We are in the middle of a clean energy revolution that no single person or group can stop...My friends, it’s time to fight like our world depends on it. Because it does. And because together we will win." Even members of Trump's own cabinet oppose him. This includes Secretary of State Rex Tillerson, Ivanka Trump and Jared Kushner. The Presiding Episcopal Bishop also responded to Trump’s decision to pull U.S. out of the accord. Trumps exit from the Paris climate deal was described as 'deeply troubling' by Catholic leaders. The contrast between the environmental advocacy of Pope Francis and Trump's climate denial could not be more stark. The pope even compared Trump to those who believed the Earth was flat. There are also a number of strong reactions from environmental groups. The NRDC calls Trump’s withdrawal from the Paris Climate Agreement "a grave mistake that hurts our country—starting now". NRDC president Rhea Suh also said, "The president's reckless move threatens more than just the environment—it hurts the economy and puts national security at risk." The Sierra Club’s executive director, Michael Brune, called the move a "historic mistake which our grandchildren will look back on with stunned dismay at how a world leader could be so divorced from reality and morality." EDF's Sam Parry said, "History will show that at a crucial time for American to show moral, global leadership to confront climate change, our President did not." As reported by Bloomberg, group of America's biggest CEO's sent a letter to Trump urging him to adhere to the agreement as part of his "America First" slogan. Twenty-five companies, including Intel Corp., Microsoft Corp. and PG&E Corp., signed on to a letter. "By expanding markets for innovative clean technologies, the agreement generates jobs and economic growth," the open letter says. "U.S. companies are well positioned to lead in these markets. Withdrawing from the agreement will limit our access to them and could expose us to retaliatory measures." Two dozen companies took out full page ads urging Trump to stay with the deal. This includes the top U.S. tech, power, retail, health, consumer goods, manufacturing, and financial services companies, with a combined market capitalization of over $3.2 trillion. Companies signing the letter include: Adobe; Apple; Blue Cross Blue Shield of Massachusetts; Danfoss; Dignity Health, Facebook; Gap, Inc.; Google; Hewlett Packard Enterprise; Ingersoll Rand; Intel Corporation; Johnson Controls; Levi Strauss & Co.; Mars Incorporated; Microsoft; Morgan Stanley; National Grid; PG&E Corporation; Royal DSM; Salesforce; Schneider Electric; Tiffany and Co.; Unilever; and VF Corporation. "760 and counting corporations have asked the Trump presidency to not withdraw from the Paris agreement, to stay in the agreement, to stay the course of decarbonisation," Figueres, told Channel4 News. Travis Nichols, a spokesman for Greenpeace USA said, "these companies are on the right side of history." Even the big oil companies (BP, Shell, Exxon, ConocoPhillips, Eni, Total, and Statoil) all urged Trump to stick with the deal. After the announcement there was a chorus of resistance from business leaders. This includes Apple, Google, Disney, Tesla, General Electric. Tesla’s Elon Musk and Disney’s Robert Iger, both quit White House advisory councils as a result of the decision. Several executives expressed their disappointment including Jeff Immelt, the chairman and chief executive of General Electric. "Disappointed with today’s decision on the Paris Agreement. Climate change is real. Industry must now lead and not depend on government," Immelt said in a Twitter message. Even big oil and gas companies, the very people that Trump claims to want to help, said they wanted Trump to keep America in the climate accord. More than 215 global investors including Calpers, Amundi and Schroders, collectively managing more than $15 trillion in assets, sent a letter to President Trump and other G20 leaders urging them to support and swiftly implement the climate accord. A leading impact investment bank said Trump's decision is "dragging the world back into an age of darkness, marked by ignorance, unconsciousness, greed, and arrogance.". These remarks were made by Big Path Capitol an investment bank that assists impact & sustainable companies and funds in mergers, acquisitions, and capital raises. They say that Paris affords, "one of the biggest economic opportunities driving the future." Trump's decision means that this is a lost opportunity for the US. Ahead of the decision, Pelle Pedersen, head of responsible investment at PKA, the Danish pension fund that oversees €35bn for 300,000 Danish workers and one of the signatories of the letter, said: “Mr Trump’s potential decision to leave the Paris agreement would be poison for global climate efforts and leave investors in a limbo of uncertainty." Steve Waygood, chief responsible investment officer at Aviva Investors, which manages £319bn in assets, said: "Any backsliding by President Trump will be a financial and economic loss for us all, not just the US economy. Unravelling [the] Paris [agreement] would also be a disaster for future generations." What makes Trump's decision so absurd is that it flies in the face of his promise to deliver jobs. Investing in climate action is an economic boon not a liability. According to one study climate action represents a $19 trillion opportunity. Most economists agree that Paris will not harm the economy, but Trump and his supporters are not fond of experts or people who know what they are talking about. The United Nations’ main Twitter page quoted Secretary-General Antonio Guterres as saying, "Climate change is undeniable. Climate change is unstoppable. Climate solutions provide opportunities that are unmatchable." In his rejection speech Trump claimed he was leaving Paris for the people he claims to be serving. He did not reference the polls which show the vast majority of Americans including Republicans, support the deal. Trump may try to portray himself as a businessman who knows something about the economy but this is a baseless claim that he definitively laid to rest with his decision to exit the Paris Agreement. Trump also indicated that his egress from the climate agreement is for cities like Pittsburgh, "I was elected to represent the citizens of Pittsburgh, not Paris," the president said. However Pittsburgh is one of a 50-city coalition, including L.A. and New York, that pledged to adhere to the Paris agreement’s guidelines. The mayor of Pittsburg was quick to point out that Trump does not speak for his city. More than two-thirds of the people who live in the city want to see emissions limits on coal plants. In fact, BusinessInsider reports that Pittsburgh is one of many American cities that are working towards deriving their power entirely from renewable energy. Cities and several states are defying President Trump’s withdrawal from the climate accord. In 2015 "[A]ll of the states, plus 130 cities...are completely convinced of the benefit to their economy of doing climate action." In the wake of Trump's decision 187 US Mayors representing 52 million Americans, have agreed to, "adopt, honor, and uphold the commitments to the goals enshrined in the Paris Agreement." Known as the Mayors National Climate Action Agenda or Climate Mayors for short, these municipal leaders announced that they are committed to reducing their emissions consistent with the Paris Accord. These mayors from both red and blue states. "We will continue to lead. We are increasing investments in renewable energy and energy efficiency. We will buy and create more demand for electric cars and trucks. We will increase our efforts to cut greenhouse gas emissions, create a clean energy economy, and stand for environmental justice" the letter reads. "[I]f the President wants to break the promises made to our allies enshrined in the historic Paris Agreement, we’ll build and strengthen relationships around the world to protect the planet from devastating climate risks." In the wake of Trump's move to dump Paris, Michael Bloomberg has begun coordinating a group of politicians, academics and businesses that will lead on climate action. This includes representatives of American cities, states and companies. They are preparing to submit a plan to the United Nations pledging to meet the United States’ greenhouse gas emissions targets under the Paris climate accord. As of the writing of this piece on June 3, the group currently includes 30 mayors, three governors, more than 80 university presidents and more than 100 businesses wants its submissions to be accepted at the UN alongside contributions to the Paris climate deal by other nations. "We’re going to do everything America would have done if it had stayed committed," Bloomberg said in an interview. By redoubling their climate efforts, he said, cities, states and corporations could achieve, or even surpass, the pledge of the administration of former President Barack Obama to reduce America’s planet-warming greenhouse gas emissions 26 percent by 2025, from their levels in 2005. "Americans are not walking away from the Paris Climate Agreement," Bloomberg said. "Just the opposite - we are forging ahead." Trump has said he intends to end all support for UN climate change efforts, eliminating the US contribution to the UNFCCC, the UN's climate negotiating body. Bloomberg has said his charities would make up for the shortfall. "Americans will honor and fulfill the Paris Agreement by leading from the bottom up - and there isn't anything Washington can do to stop us," Bloomberg said. The New York Times quotes R. Nicholas Burns, a retired career diplomat and an under secretary of state for President George W. Bush as saying: "From a foreign policy perspective, it’s a colossal mistake — an abdication of American leadership." "Pulling out of Paris would be the worst thing for brand America since Abu Ghraib," said Nigel Purvis, a top environmental negotiator in the Clinton and George W. Bush administrations and the chief executive of Climate Advisers, a consulting firm. The Brookings Institute has released an article that clearly articulates the view that Trump's decision to leave Paris is a foreign policy disaster. At a news conference China's Premier Li Keqiang schooled Trump citing the "global consensus" on climate change and calling the orange dictator to honor his "international responsibility" to fight it. French President Macron said that Trump's decision was a mistake for the US and the world. He goes on to invite those who want to continue the fight to come to France. He ends by saying that France will continue its climate leadership urging us to be confident that we will succeed. New global alliances are already forming that will further marginalize the US. President Xi Jinping of China, the world’s biggest polluter, has promised that his country will continue to act on climate change. During a telephone call in early May with President Emmanuel Macron of France, according to the Chinese Foreign Ministry, Mr. Xi told the newly elected French leader that China and France "should protect the achievements of global governance, including the Paris agreement." After Trump announced his decision, Chinese and EU leaders drafted a joint statement on the Paris climate agreement. The statement said the agreement is, "an imperative more important than ever...The Paris Agreement is proof that with shared political will and mutual trust, multilateralism can succeed in building fair and effective solutions to the most critical global problems of our time. The EU and China underline their highest political commitment to the effective implementation of the Paris Agreement in all its aspects." Both sides say they will step up action to and "forge ahead with further policies and measures" to implement their national plans on cutting carbon. Significantly, both the EU and China agree that they will outline their long term low carbon strategies by 2020." "The EU and China are joining forces to forge ahead on the implementation of the Paris agreement and accelerate the global transition to clean energy," said EU climate commissioner Miguel Arias Cañete. "If US-China climate cooperation gave birth to the Paris Agreement, now it is up to EU and China to defend and enhance it," said Li Shuo, from Greenpeace. "The Americans can't just get out of the agreement," The LA Times quotes European Commission President Jean-Claude Juncker as having said. "[W]e tried to explain this in clear, simple sentences to Mr. Trump," Juncker said, but "it looks like that attempt failed." In his rose garden speech Trump said the Paris Agreement gives people reason to "laugh at us." They are laughing Mr President and it is you that they are laughing at.